Stephen Hough has a unique affinity for the music of Chopin, whose music has always been a central part of his repertoire. His earlier Chopin recordings for Hyperion garnered huge critical acclaim. 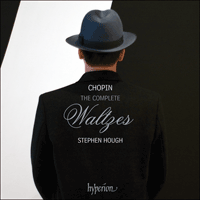 Hough’s name has become synonymous with pianistic elegance, flawless technique and immense musicianship and he has become globally renowned for his engaging and refined Chopin interpretations. In his published Waltzes Chopin brought a new level of sophistication to this popular dance form. His unpublished Waltzes are generally less complex but display considerable wit and charm, qualities ideally suited to Hough’s pianism. The disc is rounded off with the famous E flat major Nocturne, which gives a more lyrical expression to the metre of the waltz. These illuminating and compelling performances are not to be missed. Growing up in the Warsaw of the 1810s and 1820s, the young Chopin could scarcely avoid absorbing the sounds and rhythms of urban dance. Salons and dance halls resonated with pianos playing the popular steps of the day, especially mazurkas, polonaises, and—the most favoured dance of all—waltzes. Mazurkas and polonaises laced musical venues with a dash of local colour, their composers having filtered their simple works through the rhythms and accents of local peasant and aristocratic practices. (No proto-Bartók, Chopin probably knew the urban permutations of mazurkas better than he did any folk versions.) But in embracing the waltz, Varsovians gladly participated in an international vogue. For the young and youthful of Chopin’s day, waltzing meant fun, not least for the close embrace and penetrating eye contact it permitted the whirling, dancing couple. The teenage Chopin, though, seemed to have initially regarded the waltz as something of a trifle. At least this is what we might infer from the astonishment he registered to his teacher Elsner back in Warsaw upon discovering in Vienna (where Chopin resided for some months in 1831) that ‘waltzes are regarded as works here!’. Chopin distinguished between functional sound—music to accompany dance, music for the moment—and the work—music of compositional and perceptual substance, music intended, in principle at least, for greater reflection. That one might want to grant such status to a waltz, to publish it as an opus, and to linger over it at the keyboard, seemed decidedly novel to Chopin at this stage of his life. And although no one would want to claim that Chopin’s own waltzes represent anything less than the highest examples of art, the conflict implicit in his remark to Elsner—that is, the conflict between a lasting opus and a transitory diversion—defined his relationship to the waltz as it did to no other genre. This conflict manifested itself most clearly in the way Chopin’s waltzes circulated during his lifetime. He withheld from publication more than half the waltzes he composed; for no other genre did he deny public access to so many finished works. But this does not mean that he squirrelled away the unpublished waltzes. Manuscripts of waltzes counted as one of Chopin’s favourite gifts, souvenirs that he bestowed on close companions (like Maria Wodzinska, to whom he was briefly engaged) and on high-born acquaintances (like Charlotte de Rothschild, of the famous banking family). The gift of a waltz manuscript did not confer private ownership of the work: Chopin thought nothing of penning manuscripts of the same piece to give to different fortunate associates. The Waltz in F minor that we know as Op 70 No 2 (as it was numbered in its posthumous publication) apparently counted as Chopin’s favourite gift: five autograph manuscripts of it survive. And manuscripts of other waltzes proliferate as well: we know of three manuscripts of the Waltz in A flat major, Op 69 No 1. This practice could persist even when Chopin published a waltz: he presented manuscripts of the Waltz in D flat major, Op 64 No 1, to three colleagues even though he knew that the piece would also be widely available in a printed edition. 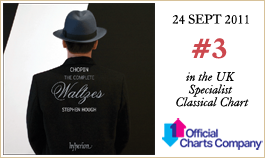 Chopin’s social generosity has an important musical consequence: his waltzes exist in an unusually high number of variant versions. The idiosyncrasies of his creative character explain this fact. When he would return to a work to prepare a new manuscript of it, he would almost never reproduce it literally from an earlier version, but would instead modify it in various ways. Some of the changes affect details (with significant alterations in areas like articulation and dynamics); others add or delete entire phrases or sections. That Chopin willingly let acquaintances see and play these versions suggests a basic level of authorial approval of the various alternate readings of a piece. Thus pianists enjoy plentiful options when choosing to play a Chopin waltz. Just as the variety of their versions reflects something of the social origins of Chopin’s waltzes, so too do certain of their compositional characteristics. The very idea of popularity seems composed into assorted aspects of the waltzes. This is especially true of the waltzes that Chopin published during his lifetime, which draw out contrasts between effervescent emotions and sentimentality that we know to have contributed so much to the fashionableness of the ballroom waltz. This emerges clearly in the first of the published waltzes, the E flat major, Op 18. The main themes of the waltz brim with the bustle of the dance floor: the stirring call to the dance of the introduction, and the rising and falling motion of the opening melodies, which (as the musicologist Eric McKee has persuasively argued) Chopin meant to reflect the spinning motions of dancing couples. The contrasting themes (with melodies in thirds and in the new key of D flat major), on the other hand, have a more reflective lilt (Chopin instructs the pianist to play one of them con anima, and the soulfulness of the melody emerges palpably). The later published waltzes in A flat major and F major (Op 34 Nos 1 and 3) remind us of the E flat major Waltz by similarly embedding moments of sentimental repose within an overall atmosphere of lively sociability. Sometimes, especially in the published waltzes cast in a minor mode (the A minor, Op 34 No 2, and the C sharp minor, Op 64 No 2), Chopin reverses the polarity in order to let melancholy sentiments reign. But in all these instances Chopin manages to ennoble the idea of contrast: the sentimental deepens the experience of the vivacious; the lively takes the edge off the emotional. Or to say it another way: out of Chopin’s contrasts emerge waltzes that are musical works. If we hear Chopin’s waltzes as lending auditory form to the practices of a particular social milieu, then we will not be surprised at some of the other concepts that emerge as premises in this genre. One of the most engaging of them is the idea of play, not only the vivacious sense of amusement that generally suffuses the waltzes, but also play as an intellectual pursuit (reminding us of the lively exchange of ideas that Chopin enjoyed in his social circles). The published waltzes revel in such brainy amusements. At the most basic level, the simple accompaniments can seem witty, the absolute necessity that their rhythmic propulsion lends to the genre belying their apparent banality. More intricate is the function of harmonic and melodic instability, as in the momentary wobbles caused by chromatic inflections in themes throughout the waltzes, the pervasive whirr of the chromatic background of the main theme in the Waltz in A flat major, Op 42, or the way the principal theme of the Waltz in A flat major, Op 64 No 3, cycles obsessively through as many keys as possible. And perhaps the best example of intellectual play is in the realm of metre. It is striking how, in a genre that is the very epitome of triple time, Chopin writes so many themes that, for periods at least, sound duple. Passages in the E flat major, Op 18, the F major, Op 34 No 3, and the D flat major, Op 64 No 1, tease duple out of triple, and of course the whole principal section of the A flat major Waltz, Op 42, sets a duple melody over a relentlessly triple accompaniment. To perceive the wit in such passages of course requires that we grasp the droll way in which Chopin deploys the simple-minded accompaniment. 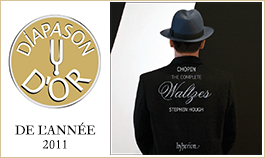 Chopin’s waltzes render socially engaged humour into a musical concept. Sometimes Chopin extended this sense of sophisticated play over an entire work. The epitome of this may be the ‘Minute’ Waltz, Op 64 No 1. The nickname is not Chopin’s—he loathed descriptive titles—but the moniker nonetheless conveys something important: the waltz unfolds as if it lasted only a minute. What the clock measures does not matter; we sense the birth and death of a musical world in a seeming instant. In this metaphorical minute, time bends: bars and beats stretch (Chopin’s famous rubato), the outer sections bustle by, the middle section sings. Chopin condenses the whole idea of the dance into a few brief moments. The waltzes that Chopin left unpublished tend to be less complex than the published waltzes. The forms themselves are often simpler (fewer themes, basic da capo designs). Still, their charms are considerable, and many of the notions he explored in the published waltzes find their ways into the waltzes he presented as gifts or otherwise kept out of the public eye. Thus the principal theme of the D flat major Waltz, Op 70 No 3, probably composed while Chopin still lived in Warsaw, foreshadows the sinuous background chromaticism of the Waltz in A flat major, Op 42. His first surviving waltz, in B minor, Op 69 No 2, plays on the destabilizing qualities of dissonant chromatic notes, heard mostly towards the beginnings of phrases. That the first copy of the piece bears the heading dolente (‘sorrowful’) suggests Chopin’s early affinity to the melancholic side of minor-mode waltzes. And it also draws attention to the larger presence of the minor-mode waltzes among the securely attributed unpublished waltzes (hence, in addition to the B minor Waltz, we also have the E minor, KKIVa/15, the F minor, Op 70 No 2, and the late A minor, KKIVb/11), telling us something, perhaps, about the sentimental tastes of Chopin’s rarefied gift-recipients (though the dramatic flair of the E minor Waltz mitigates against any simple equation between mode and affect). Two of the waltzes offer unusual, personal testimony of Chopin’s amorous sentiments toward women. In a letter to a friend, Chopin highlighted a climactic expressive passage in the Waltz in D flat major, Op 70 No 3 (unfortunately the manuscript in question does not survive, so we do not know precisely which passage), and attributed its inspiration to the young singer Konstancja Gladkowska. And, as noted above, Chopin appears to have conceived the first version of the Waltz in A flat major, Op 69 No 1, as a gift to Maria Wodzinska. But the unpublished waltzes also capture the joyfulness and glitter of the dance hall and salon, as we can hear in the waltzes in E major, KKIVa/12, A flat major, KKIVa/13 (Chopin’s only waltz notated in three-eight metre), and, especially, in G flat major, Op 70 No 1. The three remaining works, often ascribed with ‘doubtful attribution’, offer different degrees of hesitation. About the authorship of the Sostenuto in E flat major, KKIVb/10, we can be certain: the sole source for the piece is a manuscript that Chopin entered into the autograph album of Émile Gaillard on 20 July 1840. The uncertainty here concerns the genre, which Chopin did not identify—but this charming album piece certainly fits well in the company of the authentic waltzes. The early twentieth-century Polish biographer Ferdynand Hoesick identified a manuscript of the Waltz in E flat major, KKIVa/14, in the now-lost autograph album of Emilia Elsner; lacking access to this manuscript and therefore the ability to confirm its provenance, some later scholars have questioned the authenticity of the piece on stylistic grounds. And Chopin almost surely did not write the Valse mélancolique in F sharp minor, KKIb/7—but listeners can judge for themselves how well the forger imitated Chopin’s style. And set amid Chopin’s ruminations in waltz-form on the idea of musical popularity, the Nocturne in E flat major, Op 9 No 2, represents the perfect companion. In this most admired of his nocturnes, we can hear distant echoes of the accompanimental patterns of the waltz, here rendered with greater subtlety, and in the service of lyrical expression. Ayant grandi dans la Varsovie des années 1810 et 1820, le jeune Chopin ne put guère échapper aux sons et aux rythmes des danses urbaines. Les salons et les salles de danse résonnaient de l’écho des pianos jouant les rythmes alors à la mode, surtout des mazurkas, des polonaises et—danse favorite entre toutes—des valses. Les mazurkas et les polonaises insufflaient aux salles de musique une pointe de terroir, les compositeurs ayant passé leurs œuvres simples au tamis des rythmes et des accents des pratiques paysannes et aristocratiques locales. (Chopin, qui n’avait rien d’un Bartók avant la lettre, connaissait probablement mieux les combinaisons citadines des mazurkas que leurs versions traditionnelles.) En embrassant la valse, cependant, les Varsoviens participèrent gaiement à une vogue internationale. Au temps du jeune Chopin, valser était synonyme de plaisir, avant tout parce que cela permettait au virevoltant couple de danseurs de s’enlacer et d’avoir un contact visuel pénétrant. L’adolescent Chopin semble toutefois avoir d’abord tenu la valse pour une broutille, comme en témoigne, du moins, son étonnement—rentré à Varsovie, il s’en ouvrit à son professeur, Elsner—d’avoir découvert qu’à Vienne (où il passa quelques mois, en 1831) «les valses étaient considérées comme des œuvres!». Car il faisait la disctinction entre son fonctionnel—une musique pour accompagner la danse, une musique de l’instant—et œuvre—une musique à teneur compositionnelle et perceptrice, une musique destinée, en principe du moins, à une plus grande réflexion. Qu’on pût vouloir accorder ce statut à une valse, la publier en tant qu’opus et s’y attarder au clavier, voila qui parut résolument nouveau au jeune Chopin. Reste que le conflit implicitement contenu dans sa remarque à Elsner—i.e. le conflit entre œuvre durable et distraction éphémère—définit sa relation à la valse d’une manière absolument unique. Ce conflit se manifesta très clairement dans la façon dont les valses circulèrent du vivant de Chopin, qui renonça à en publier plus de la moitié, faisant de ce genre le seul pour lequel il refusa au public l’accès à tant d’œuvres achevées. Ce qui ne signifie en rien qu’il cachait ses œuvres inédites. Offrir un manuscrit était un de ses gestes favoris, un souvenir qu’il laissait à de proches camarades (ainsi Maria Wodzinska, son éphémère fiancée) et à des connaissances bien nées (telle Charlotte de Rothschild, de la célèbre famille de banquiers). Mais avoir reçu un manuscrit de valse ne signifiait pas posséder l’œuvre: Chopin trouvait naturel de copier une même pièce en plusieurs exemplaires pour l’offrir à différents, et heureux, partenaires. La Valse en fa mineur (ou l’op. 70 no 2, selon le numéro qu’on lui attribua à sa parution posthume) fut à l’évidence l’un de ses cadeaux préférés: il nous en reste cinq manuscrits autographes. Et les manuscrits d’autres valses abondent tout autant: on en connaît trois de la Valse en la bémol majeur op. 69 no 1. Cette pratique pouvait même perdurer une fois la valse publiée: Chopin offrit des manuscrits de la Valse en ré bémol majeur op. 64 no 1 à trois confrères alors même qu’il la savait bientôt largement disponible en édition imprimée. Cette générosité sociale de Chopin eut une importante conséquence musicale: ses valses présentent un nombre de variantes inhabituellement élevé, lié aux particularités de son tempérament créatif. Car lorsqu’il revenait à une œuvre pour en préparer un nouveau manuscrit, il ne la reprenait presque jamais telle quelle et la modifiait de diverses manières. Certains de ces changements affectent des détails (avec d’importantes modifications dans des domaines comme l’articulation ou la dynamique) mais parfois, ce sont des phrases, voire des sections entières qui sont ajoutées ou retranchées. Le fait que Chopin ait volontiers laissé des familiers voir et jouer ces versions suggère une certaine approbation de ces différentes lectures d’une même œuvre. Les pianistes choisissant d’exécuter une valse de Chopin disposent donc d’une foule d’options. Tout comme certaines caractéristiques compositionnelles, la variété des différentes versions reflète un peu les origines sociales des valses chopiniennes. La notion même de popularité paraît résulter de divers aspects des valses. Cela vaut tout particulièrement pour les valses que Chopin publia de son vivant, celles qui, fondées sur des contrastes entre émotions effervescentes et sentimentalité, concoururent tant, nous le savons, à la vogue de la valse pour salles de bal. Ce qui est flagrant dans la première des valses publiées par Chopin, celle en mi bémol majeur op. 18. Les thèmes principaux grouillent de l’agitation de la piste de danse: ainsi l’entraînante invitation à la danse de l’introduction, ou encore le mouvement ascendant et descendant des mélodies inaugurales que Chopin voulait (le musicologue Eric McKee l’a montré de façon convaincante) comme le reflet du tournoiement des couples de danseurs. Les thèmes contrastifs (avec des mélodies en tierces et dans le nouveau ton de ré bémol majeur), en revanche, présentent des inflexions davantage réfléchies. (Chopin demande au pianiste de jouer l’un d’entre eux con anima, et l’émotion de la mélodie affleure, palpable.) Les valses publiées ultérieurement, en la bémol majeur et en fa majeur (op. 34 nos 1 et 3), nous rappellent, par leurs moments de repos sentimental enchâssés dans un climat de sociabilité enjouée, la Valse en mi bémol majeur. Parfois, surtout dans ses valses coulées dans un mode mineur (celles en la mineur op. 34 no 2 et en ut dièse mineur op. 64 no 2), Chopin inversa la polarité pour faire régner la mélancolie. Mais, à chaque fois, il parvient à ennoblir l’idée de contraste: le sentimental approfondit l’expérience du vivace; l’enjoué émousse l’affectif. Ou, pour le dire autrement, des contrastes chopiniens surgissent des valses qui sont des œuvres musicales. Si l’on considère que les valses chopiniennes confèrent une forme auditive aux pratiques d’un milieu social donné, on ne s’étonnera guère de voir certains autres concepts émerger comme des prémices du genre, l’un des plus séduisants étant l’idée du jeu, l’amusement vivace qui baigne généralement les valses, mais aussi le jeu en tant qu’occupation intellectuelle (ce qui nous rappelle les échanges d’idées animés goûtés par Chopin dans ses cercles mondains). Les valses publiées se délectent de ces amusements intelligents. Au niveau le plus basique, les accompagnements simples peuvent paraître verveux, l’absolue nécessité que leur propulsion rythmique confère au genre démentant leur apparente banalité. Plus complexe est la fonction de l’instabilité harmonico-mélodique perceptible dans les très brèves hésitations provoquées par les inflexions chromatiques des thèmes des valses, dans le bruissement invasif du fond chromatique du thème principal de la Valse en la bémol majeur op. 42, ou dans la manière dont le thème principal de la Valse en la bémol majeur op. 64 no 3 emprunte maladivement le plus de tonalités possible. Et le meilleur exemple de jeu intellectuel se trouve peut-être dans le domaine du mètre. On est frappé de voir comment, dans un genre qui est la quintessence même de la mesure ternaire, Chopin écrit force thèmes qui, momentanément du moins, semblent binaires. Certains passages des valses en mi bémol majeur op. 18, en fa majeur op. 34 no 3 et en ré bémol majeur op. 64 no 1 font ressortir le binaire du ternaire et, naturellement, il y a toute la section principale de la Valse en la bémol majeur op. 42 qui dispose une mélodie binaire par-dessus un accompagnement constamment ternaire. Impossible de percevoir la verve de ces passages sans saisir, bien sûr, la drôle de manière chopinienne de déployer l’accompagnement simplet. Les valses de Chopin traduisent en concept musical un humour socialement engagé. Parfois, Chopin étendit ce sens du jeu sophistiqué à toute une œuvre—la Valse «Minute» op. 64 no 1 en est l’exemple même. Ce surnom n’est pas de Chopin—il détestait les titres descriptifs—mais il véhicule une idée importante: la valse s’éploie comme si elle ne durait qu’une minute. Peu importe ce que mesure l’horloge: en ce qui nous semble un instant, nous ressentons la naissance et la mort d’un monde musical. En cette minute métaphorique, le temps se tord: mesures et temps s’étirent (le fameux rubato chopinien), les sections extrêmes s’agitent, la section centrale chante. Toute l’idée de la danse, Chopin la condense en quelques brefs moments. Les valses que Chopin laissa inédites tendent à être moins complexes que celles publiées. Malgré des formes souvent simplifiées (moins de thèmes, modèles basiques avec da capo), elles dégagent un charme considérable et nombre des notions explorées dans les valses publiées se retrouvent dans ces œuvres offertes en cadeau ou cachées au public. Le thème principal de la Valse en ré bémol majeur op. 70 no 3, probablement écrite alors que Chopin vivait encore à Varsovie, préfigure ainsi le sinueux chromatisme présent en fond de la Valse en la bémol majeur op. 42. La Valse en si mineur op. 69 no 2, la première valse chopinienne à nous avoir été conservée, joue sur les vertus déstabilisatrices des notes chromatiques dissonantes, entendues surtout en début de phrases. La première copie porte le titre dolente («triste»), suggérant une affinité initiale de Chopin avec la mélancolie des valses en mineur. Ce qui attire notre attention sur le grand nombre de pièces en mineur parmi les valses attribuées avec certitude (la Valse en si mineur, donc, mais aussi celle en mi mineur KKIVa/15, celle en fa mineur op. 70 no 2 et celle, tardive, en la mineur KKIVb/11), signe, peut-être, des goûts sentimentaux des rares récipiendaires des cadeaux de Chopin (encore que le style dramatique de la Valse en mi mineur tempère toute équation simpliste entre mode et affect). Deux valses offrent un témoignage inhabituel des sentiments amoureux de Chopin envers les femmes. Dans un lettre à un ami, il insista sur un passage expressif paroxystique de la valse en ré bémol majeur op. 70 no 3 (hélas, le manuscrit en question ne nous ayant pas été conservé, nous ignorons de quel passage il s’agit au juste), que lui aurait inspiré la jeune chanteuse Konstancja Gladkowska. En outre, comme nous l’avons vu, la première version de la Valse en la bémol majeur op. 69 no 1 semble avoir été conçue comme un cadeau à Maria Wodzinska. Ce qui n’empêche pas les valses inédites de capturer aussi l’allégresse et le chatoiement de la salle de danse et du salon, comme nous le donnent à entendre les valses en mi majeur KKIVa/12, en la bémol majeur KKIVa/13 (l’unique valse chopinienne à 38) et, surtout, en sol bémol majeur op. 70 no 1. Les trois œuvres restantes, souvent d’attribution douteuse, présentent divers degrés d’hésitation. Nous pouvons être certains de la paternité du Sostenuto en mi bémol majeur KKIVb/10: l’unique source dont nous disposons est un manuscrit que Chopin inséra dans l’album autographe d’Émile Gaillard, le 20 juillet 1840. Ici, l’incertitude pèse sur le genre, que Chopin ne précisa pas, mais ce charmant morceau d’album va bien avec les valses authentiques. Au début du XXe siècle, le biographe polonais Ferdynand Hoesick identifia un manuscrit de la valse en mi bémol majeur KKIVa/14 dans l’album autographe, aujourd’hui perdu, d’Emilia Elsner; sans accès au manuscrit, et donc incapables d’en confirmer la provenance, des spécialistes ultérieurs, se fondant sur des bases stylistiques, ont mis en doute l’authenticité de cette œuvre. Enfin, Chopin n’écrivit certainement pas la Valse mélancolique en fa dièse mineur KKIb/7—mais les auditeurs apprécieront par eux-mêmes comme le faussaire imita bien son style. Le Nocturne en mi bémol majeur op. 9 no 2 accompagne à merveille les ruminations, dans la forme valse, auxquelles Chopin se livra sur la popularité musicale. Dans ce Nocturne, le plus admiré de tous, on entend de lointains échos des modèles accompagnants de la valse, rendus ici avec une subtilité accrue, au service de l’expression lyrique. Als der junge Chopin zu Beginn des 19. Jahrhunderts in Warschau aufwuchs, konnte er sich den Klängen und Rhythmen des städtischen Tanzes praktisch nicht entziehen. In den Salons und Tanzhallen erklangen die populären Tänze der Zeit, insbesondere Mazurken, Polonaisen und—der beliebteste Tanz überhaupt—Walzer, die alle auf dem Klavier gespielt wurden. Die Mazurken und Polonaisen sorgten in den Aufführungsorten für einen Schuss Lokalkolorit, wobei die Komponisten ihre schlichten Werke mit den Rhythmen und Dialekten der örtlichen Bauern- und Aristokratenbevölkerung anreicherten. (Anders als Bartók nach ihm, kannte Chopin die städtischen Permutationen der Mazurken besser als volkstümliche Versionen.) Doch mit ihrer Vorliebe für den Walzer folgten die Warschauer begeistert der internationalen Mode. Für die Jungen und Jugendlichen zu Chopins Zeit bedeutete das Walzertanzen ein Vergnügen, nicht zuletzt aufgrund des engen körperlichen und Augenkontakts, der dem sich drehenden, tanzenden Paar zugestanden wurde. Der jugendliche Chopin schien den Walzer jedoch zunächst nicht ganz ernst zu nehmen. Das darf man jedenfalls angesichts der Verwunderung annehmen, die er gegenüber seinem Lehrer Joseph Elsner zeigte, als er nach einer Wienreise (wo Chopin sich im Jahr 1831 einige Monate lang aufgehalten hatte) bemerkte, dass „Walzer dort als Werke betrachtet werden!“. Chopin unterschied zwischen Funktionsmusik—Musik für den Augenblick, also etwa Tanzbegleitung—und komponierten Werken, also Musik von kompositorischer und wahrnehmbarer Substanz, die grundsätzlich gründlicher reflektiert werden sollte. Dass man einem Walzer einen solchen Status zubilligen, ihn als ein Opus herausgeben und ihn am Klavier länger reflektieren solle, war für Chopin zu jener Zeit noch ein neuartiges Konzept. Und obwohl man den Chopinschen Walzern natürlich niemals ihre große Kunstfertigkeit aberkennen wollte, ist der Konflikt, der in seiner Bemerkung gegenüber Elsner deutlich wird (nämlich der Konflikt zwischen einem andauernden Opus und einer vorübergehenden Unterhaltung), doch in seinem Verhältnis mit dem Walzer derart prägend, wie es bei keinem anderen Genre der Fall war. Dieser Konflikt zeichnete sich am deutlichsten in der Art der Vervielfältigung der Walzer zu Chopins Lebzeiten ab. Er hielt mehr als die Hälfte seiner Walzer vor der Publikation zurück; bei keinem anderen Genre verweigerte er öffentlichen Zugang zu so vielen vollendeten Werken. Doch bedeutet das nicht, dass er die unveröffentlichten Walzer hortete. Walzer-Manuskripte galten als besonders beliebte Geschenke von Chopin, als Andenken, die er engen Vertrauten (wie etwa Maria Wodzinska, mit der er kurzzeitig verlobt war) und hochwohlgeborenen Bekannten (wie etwa Charlotte de Rothschild aus der berühmten Bankiersfamilie) schenkte. Wenn er ein Walzer-Manuskript verschenkte, hieß das jedoch nicht, dass damit das Werk in das Privateigentum der beschenkten Person überging—Chopin hatte keine Skrupel, dasselbe Stück mehrmals aufzuschreiben und dann unterschiedlichen glücklichen Bekannten zu schenken. Der Walzer in f-Moll, der heutzutage als op. 70 Nr. 2 (entsprechend der Nummerierung der posthumen Publikation) bekannt ist, war offenbar Chopins Lieblingsgeschenk, da fünf Autographe davon überliefert sind. Auch sind Manuskripte von anderen Walzern verbreitet—so sind drei Manuskripte des Walzers in As-Dur op. 69 Nr. 1 bekannt. Diese Handhabung dauerte zuweilen sogar fort, wenn Chopin einen Walzer bereits publiziert hatte: er verschenkte Manuskripte des Walzers in Des-Dur op. 64 Nr. 1 an drei Kollegen, obwohl er wusste, dass das Stück auch in der Druckversion weithin erhältlich war. Chopins Großzügigkeit trug die wichtige musikalische Konsequenz in sich, dass seine Walzer in ungewöhnlich vielen Varianten existieren. Die Eigenarten seines kreativen Charakters erklären diese Tatsache. Wenn er sich einem Werk zuwandte, um davon ein Manuskript anzufertigen, reproduzierte er es praktisch nie genau, sondern nahm zumeist verschiedene Veränderungen vor. Einige dieser Veränderungen betrafen Details (wobei größere Abwandlungen im Bereich der Artikulation oder der Dynamik stattfanden); anderswo wurden ganze Phrasen oder Abschnitte hinzugefügt oder gestrichen. Dass Chopin Bekannte diese Versionen bereitwillig sehen und spielen ließ, deutet auf eine grundsätzliche auktoriale Billigung der verschiedenen und unterschiedlichen Auslegungen eines Stückes hin. Den Pianisten sind damit reichlich Alternativen bei der Wahl eines Chopin-Walzers gegeben. Ebenso wie die unterschiedlichen Versionen in gewisser Weise die sozialen Hintergründe der Chopinschen Walzer widerspiegeln, so ist dies auch bei mehreren kompositorischen Charakteristika der Fall. Die bloße Vorstellung von Popularität scheint in diverse Aspekte der Walzer bereits hineinkomponiert zu sein. Das ist insbesondere bei den Walzern der Fall, die Chopin zu seinen Lebzeiten herausgab, in denen die Kontraste zwischen überschäumenden Emotionen und Sentimentalität herausgearbeitet sind, die bekanntermaßen so viel zu der Modernität des Walzers als Gesellschaftstanz beigetragen haben. Dies tritt deutlich in dem ersten der publizierten Walzer hervor, nämlich dem in Es-Dur, op. 18. Die Hauptthemen dieses Walzers stellen die Betriebsamkeit auf dem Tanzboden lebhaft dar: die mitreißende Aufforderung zum Tanz in der Einleitung und die aufsteigende und abfallende Bewegung der Anfangsmelodien, mit denen (wie der Musikwissenschaftler Eric McKee überzeugend dargelegt hat) Chopin wohl die sich drehenden Tanzpaare darstellte. Die gegensätzlichen Themen (mit Melodien in Terzen und in der neuen Tonart Des-Dur) hingegen wirken eher nachdenklich (Chopin weist den Pianisten an, eines davon con anima aufzufassen, und das Seelenvolle der Melodie tritt spürbar hervor). Die später herausgegebenen Walzer in As-Dur und F-Dur (op. 34, Nr. 1 und 3) erinnern an den Es-Dur Walzer, da hier auf ähnliche Weise Momente von sentimentaler Ruhe mit einer Atmosphäre lebhaften gesellschaftlichen Treibens kombiniert werden. Manchmal, besonders in den veröffentlichten und in Moll angelegten Walzern (a-Moll op. 34 Nr. 2 und cis-Moll op. 64 Nr. 2) kehrt Chopin die Pole um, so dass die melancholischen Emotionen vorherrschen. In allen diesen Fällen jedoch gelingt es Chopin, das Konzept des Kontrasts zu veredeln: das Sentimentale vertieft das Lebhafte und das Beschwingte lindert das Emotionale. Mit anderen Worten: aus Chopins Kontrasten entstehen Walzer, die musikalische Werke sind. Wenn man Chopins Walzer als ein Hörbarmachen der Gewohnheiten eines bestimmten sozialen Milieus versteht, so sind auch einige andere Konzepte, die in diesem Genre sichtbar werden, nicht weiter überraschend. Besonders einnehmend dabei ist die Idee des Spiels—nicht nur in dem munteren Sinn von Vergnügung, von dem die Walzer allgemein erfüllt sind, sondern auch in der Bedeutung von Spiel als intellektuelle Beschäftigung (was an den lebhaften Ideenaustausch erinnert, den Chopin in seinen sozialen Zirkeln genoss). Die publizierten Walzer schwelgen geradezu in solchen intelligenten Unterhaltungen. Auf der elementarsten Ebene können die schlichten Begleitungen geistreich wirken, so dass die für das Genre absolut notwendige rhythmische Bewegung in ihrer offensichtlichen Banalität enttäuscht. Komplexer ist die Funktion der harmonischen und melodischen Instabilität, wie etwa bei dem kurzzeitigen Flattern, das durch chromatische Modifizierungen in den Walzerthemen entsteht, dem durchdringenden Schwirren des chromatischen Hintergrunds des Hauptthemas in dem Walzer in As-Dur op. 42, oder auch dem obsessiven Kreisen durch möglichst viele Tonarten im Walzer in As-Dur op. 64 Nr. 3. Das vielleicht beste Beispiel für intellektuelles Spiel liegt im Bereich des Metrums. Es ist auffällig, dass Chopin in einem Genre, das den Dreiertakt geradezu verkörpert, derart viele Themen schreibt, die zumindest zeitweilig klingen, als stünden sie im Zweiertakt. Passagen in den Walzern in Es-Dur (op. 18), F-Dur (op. 34 Nr. 3) und Des-Dur (op. 64 Nr. 1) kitzeln aus dem Dreier- einen Zweiertakt heraus und in dem gesamten Hauptteil des As-Dur Walzers op. 42 ist eine Zweiertakt-Melodie über eine unermüdliche Dreiertakt-Begleitung gesetzt. Um den Witz solcher Passagen wahrzunehmen, muss man natürlich die Komik der schlichten Begleitungen Chopins verstehen. Chopins Walzer machen sozial engagierten Humor zu einem musikalischen Konzept. Manchmal dehnte Chopin diese Art von intellektuellem Spiel über ein ganzes Werk aus. Das beste Beispiel hierfür mag der „Minutenwalzer“ op. 64 Nr. 1 sein. Der Spitzname stammt nicht von Chopin—er hasste beschreibende Titel—doch wird dadurch gleichwohl auf etwas Wichtiges hingewiesen: der Walzer entfaltet sich, als ob er eine Dauer von nur einer Minute hätte. Was die Uhr sagt, ist hier uninteressant; der Hörer spürt das Entstehen und Sterben einer musikalischen Welt in anscheinend einem Augenblick. In dieser metaphorischen Minute ist die Zeit gekrümmt: Takte und Schläge dehnen sich aus (Chopins berühmtes Rubato), die äußeren Teile eilen heran und der Mittelteil singt. Chopin komprimiert das gesamte Konzept eines Tanzes auf einige kurze Momente. Die Walzer, die Chopin nicht publizieren ließ, sind zum größten Teil weniger komplex gehalten als die veröffentlichten Walzer. Die Formen an sich sind oft schlichter (weniger Themen, einfache da-capo-Anlagen). Sie besitzen trotzdem beträchtliche Reize und viele Einfälle, die er in den veröffentlichten Walzern verarbeitet, tauchen auch in den Walzern auf, die er als Geschenke oder in anderer Weise der Öffentlichkeit vorenthielt. So nimmt das Hauptthema des Des-Dur Walzers op. 70 Nr. 3, der wahrscheinlich entstand, als Chopin noch in Warschau lebte, die geschmeidige Hintergrundchromatik des Walzers in As-Dur op. 42 vorweg. Sein erster überlieferter Walzer, op. 69 Nr. 2 in h-Moll, spielt mit den destabilisierenden Eigenschaften von dissonanten chromatischen Tönen, die zumeist jeweils am Anfang von Phrasen stehen. Das erste Exemplar des Stücks ist mit dolente („trauervoll“) überschrieben, was auf Chopins frühe Neigung zu der melancholischen Seite von Moll-Walzern hinweist. Zudem wird dadurch die Aufmerksamkeit auf die größere Anzahl von Moll-Walzern unter den sicher zugeschriebenen unveröffentlichten Walzern gelenkt (so existieren neben dem h-Moll Walzer ebenso einer in e-Moll, KKIVa/15, in f-Moll, op. 70 Nr. 2 sowie der späte a-Moll Walzer KKIVb/11), was vielleicht etwas über die sentimentalen Geschmacksausprägungen der von Chopin Beschenkten aussagt (obwohl das dramatische Flair des e-Moll Walzers einer einfachen Gleichsetzung von Tongeschlecht und Affekt entgegensteuert). Zwei der Walzer gewähren einen ungewohnt persönlichen Einblick in Chopins amouröse Gefühle gegenüber Frauen. In einem Brief an einen Freund unterstrich Chopin eine höhepunktartige expressive Passage in dem Walzer in Des-Dur op. 70 Nr. 3 (leider ist das entsprechende Manuskript nicht überliefert, so dass man nicht mit Sicherheit sagen kann, um welche Passage genau es sich dabei handelt) und führte die junge Sängerin Konstancja Gladkowska als Inspiration an. Und, wie oben erwähnt, scheint Chopin die erste Version des Walzers in As-Dur op. 69 Nr. 1 als Geschenk an Maria Wodzinska konzipiert zu haben. Doch fangen die unveröffentlichten Walzer Chopins auch die Fröhlichkeit und den Glanz des Tanzsaals und Salons ein, wie in den Walzern in E-Dur KKIVa/12, As-Dur KKIVa/13 (Chopins einziger Walzer in 38) und—insbesondere—in Ges-Dur op. 70 Nr. 1 deutlich wird. Die drei übrigen Werke, deren Autorenschaft nicht gesichert ist, sind unterschiedlich in Frage zu stellen. Man kann davon ausgehen, dass das Sostenuto in Es-Dur, KKIVb/10 von Chopin stammt: die einzige Quelle des Stücks ist ein Manuskript, das Chopin am 20. Juli 1840 in ein Manuskript-Album von Émile Gaillard einfügte. Die Unsicherheit betrifft in diesem Fall das Genre, das Chopin nicht identifizierte—doch passt dieses charmante Albumstück trotzdem gut zu den authentischen Walzern. Der polnische Chopin-Biograf des frühen 20. Jahrhunderts, Ferdynand Hoesick, identifizierte ein Manuskript des Walzers in Es-Dur KKIVa/14 in einem inzwischen verschollenen Manuskript-Album von Emilia Elsner. Da dieses Manuskript nicht mehr einsehbar ist und deshalb seine Herkunft nicht bestätigt werden kann, haben einige spätere Forscher die Authentizität des Werks aufgrund seiner Stilistik angezweifelt. Und man kann fast mit Sicherheit davon ausgehen, dass Chopin die Valse mélancolique in fis-Moll KKIb/7 nicht komponiert hat—doch können die Hörer dieser CD selbst beurteilen, wie gut der Fälscher den Stil Chopins imitierte. Inmitten von Chopins Grübeleien über die Idee der musikalischen Popularität in Walzerform stellt das Nocturne in Es-Dur op. 9 Nr. 2 das ideale Begleitstück dar. In diesem Werk, dem bewundertsten seiner Nocturnes, sind entfernte Echos der Begleitmuster des Walzers zu hören, die hier mit größerer Subtilität eingearbeitet sind und im Dienst des lyrischen Ausdrucks auftreten.